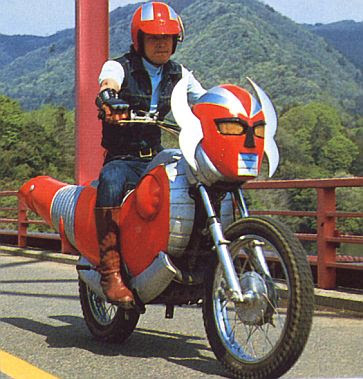 Denjin Zaborger was a Japanese tokusatsu television series that aired in 1974, produced by P Productions, it was their last tokusatsu series of the 1970s. Denjin Zaborger stars Akira Yamaguchi (Joji Yuki ) as secret agent Yutaka Daimon. The robot Denjin Zaborger has no personality at all, its Akira Yamaguchi as the wild warrior Yutaka Daimon who gives the series its heart. Secret Police (Himitsu Keiji) agent Yutaka Daimon returns to Japan after learning his father was murdered by the evil Dr. Akunomiya leader of the criminal gang Sigma (named after the Greek letter). From his father Yutaka inherited the robot warrior Denjin Zaborger which respondes to Yutaka's voice commands. 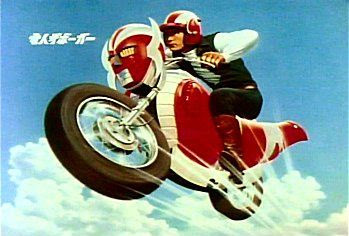 Zaborger has the unique ability to transform into a motorcycle, Machine Zaborger, for Yutaka Daimon to ride. "It is the future, and American astronauts have again landed on the moon. 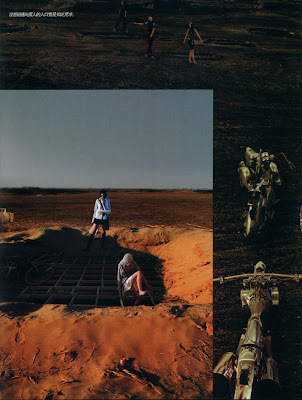 Emerging from their spacecraft, they perform such familiar chores as setting up a TV camera, placing various scientific instruments around their landing site, and collecting rocks and samples of the dusty lunar soil. Then they return to the ship to prepare for more far-ranging exploration. When the spacecraft's big hatch reopens, the astronauts scoot out, pedaling away as if they were on bicycles. A bike on the moon? Yes, says M.I.T. Mechanical Engineer David Gordon Wilson, who insists human-powered transportation, as he calls it, is really the only way to go on a moon mission. Adds Wilson: "Such a vehicle offers lunar explorers convenience, reliability, independence of energy supplies and beneficial physiological effects." Wilson, co-author of the book Bicycling Science, is admittedly something of a bike nut. He pedals to class rain or shine. 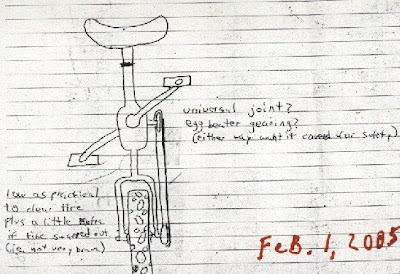 Even before Project Apollo was on the launchpad, he tried vainly to persuade NASA to include a pedal-powered vehicle. But the space agency opted instead for its $38 million, battery-driven lunar rover, a two-man vehicle that took up valuable payload capacity. Unfazed by NASA's skepticism, Wilson is peddling his idea again. Writing in the magazine Galileo, he calculates that in the lunar environment, with its low gravity (only one-sixth that of earth's) and virtual lack of atmosphere, even an astronaut weighted with life-support equipment could easily achieve speeds in excess of 30 kph (19 m.p.h.) 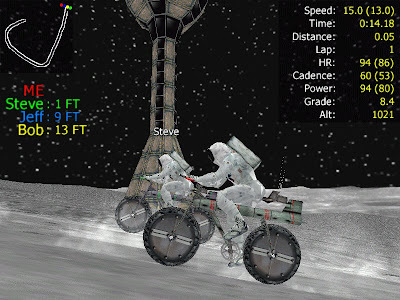 aboard an appropriately designed lunar bike. 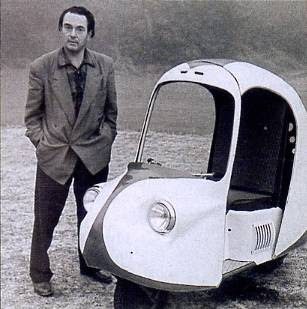 Accordingly, Wilson is proposing a two-seat lunar vehicle or quadracycle, made of lightweight metals. It would have wheels of a metallic mesh like those on the lunar rover to cope with the moon's dusty surface. 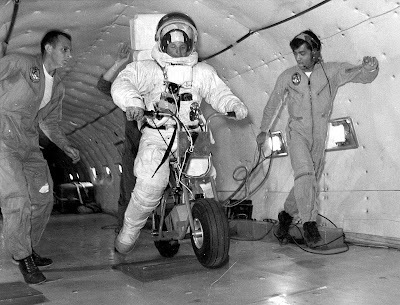 Both astronauts would pedal while sitting; with a load of scientific gear, they could easily travel several kilometers without unduly exerting themselves. Best of all, while the cost of getting to the moon may be skyhigh, moving around on it should be dust-cheap." Dispatch riders: The Canadian Signal Corps. Inglis Sheldon-Williams "Motorcycle courier, Canadian Signal Corps, 1917". 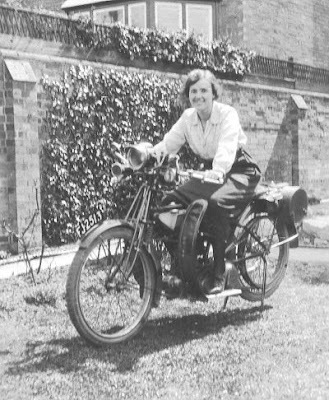 "In the days before portable and reliable radio sets, motorcycle couriers (or 'dispatch riders') were often the fastest way of moving messages to and from the battlefield, especially when laying telephone or telegraph lines was impossible. 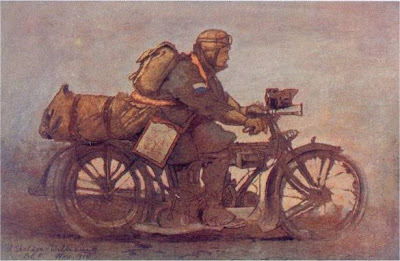 This 1917 painting of a courier with his mechanical mount is by Inglis Sheldon-Williams, an official Canadian war artist. Note the white over blue badge on this man's arm. 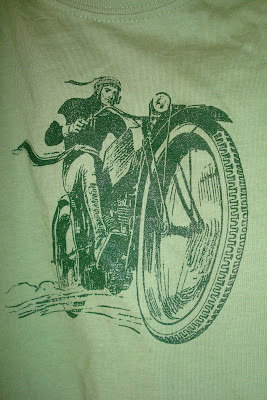 When the first motorcycle dispatch riders were introduced, they wore a blue/white brassard on their arm. The colour combination was used for signal flags, and was distinctive enough help give dispatch riders priority on the roads". "How would you like to give your scooter a couple of solar wings? Well, it might not exactly take off in to the upper reaches of the atmosphere, but it will at least keep it clean and pollution free. Not many would have tried anything like this and even though it might look a touch ungainly, it still is a fine example of how you can make a difference to the planet all on your own. 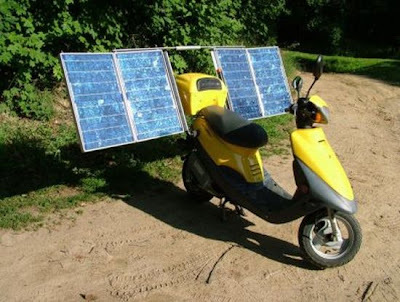 This modified scooter runs on solar energy (as is obvious) and it has been done without much fuss or complication. It just goes to show that we all can change the world we live in with a bit of effort and some honest commitment. Don Dunklee has applied some ingenuity and come up with a way to charge his electric scooter using solar panels. The best part is that he's put the instructions on how to build your own solar scooter on for our use. The solar panels on the bike fold in for driving, and out for charging. Don rides the scooter 5 miles to work each day, and can fold the panels out for charging the battery while parked at work." "You’d be forgiven if you thought these sizzling action scenes are from the next Bond movie, but they are actually from a recent Chinese FHM photoshoot by the super talented Chen Zhun. Zhun delivers an amazing animation-inspired ‘mangalicious’ photoshoot that is a visual explosion of hot females, guns, badass bikes, edgy action, flying bullets, and a futuristic vibe." 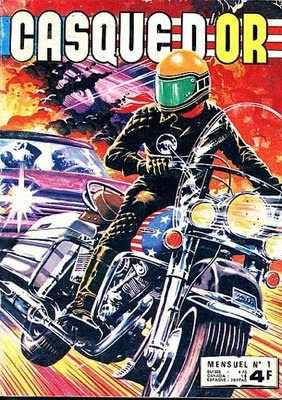 The motorcycle in cinema-Fritz the Cat. "Fritz the Cat is a 1972 animated film written and directed by Ralph Bakshi as his feature film debut. Based on the comic books by Robert Crumb, the film was the first animated feature film to receive an X rating in the United States. It focuses on Fritz (voiced by Skip Hinnant), an anthropomorphic feline in the mid-1960s who seduces many female animals in New York City while staying one step ahead of the law. The film is a satire focusing on American college life of the era, race relations, the free love movement, and left- and right-wing politics. Fritz the Cat was the first independent animated film to gross more than $100 million at the box office. Fritz the Cat had a troubled production history and controversial release. Creator Robert Crumb is known to have had disagreements with the filmmakers, claiming in interviews that his first wife signed over the film rights to the characters, and that he did not approve the production. Crumb was also critical of the film's approach to his material. 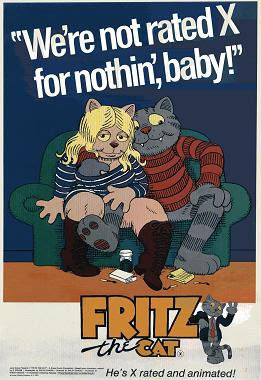 Fritz the Cat was controversial for its rating and content, which viewers at the time found to be offensive. Its success led to a slew of other X-rated animated films, and a sequel, The Nine Lives of Fritz the Cat, was made without Crumb's or Bakshi's involvement. Fritz the Cat was ranked as the 51st greatest animated film of all time by the Online Film Critics Society, and was also featured at number 56 on Channel 4's list of the 100 Greatest Cartoons." "Tourist Trophy (marketed as "The Real Riding Simulator") is a motorcycle racing game for the PlayStation 2. This game has been designed by the team who made the popular Gran Turismo series, Polyphony Digital. 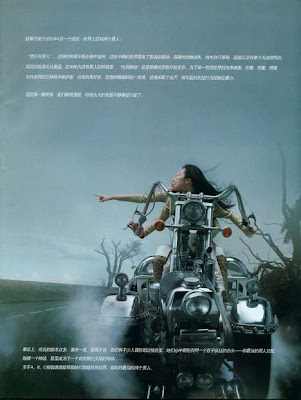 It was first released in China on January 26, 2006. Then in Japan on February 2, and rated 32/40 (Silver rank) Weekly Famitsu, a Japanese video game magazine. 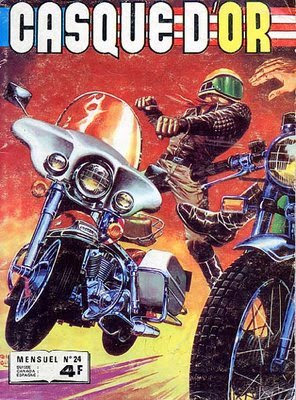 The North American edition was officially released on April 4, 2006 with seven extra motorcycles, new riding gear, seven bonus background music (BGM) tracks, enhanced visual effects, an exclusive "Semi-Pro Mode" and bike profiles. Developer Polyphony Digital reused the physics engine, graphical user interface and all but one of the circuits found in Gran Turismo 4. However, the number of AI racers (computer controlled opponents) has been reduced from five in the Gran Turismo series to only three. 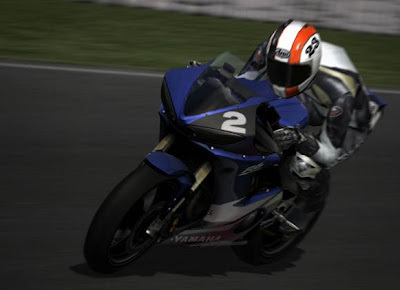 Tourist Trophy also uses the famous "License School" feature which was popularized by the Gran Turismo series as well as the "Photo Mode" introduced in Gran Turismo 4. 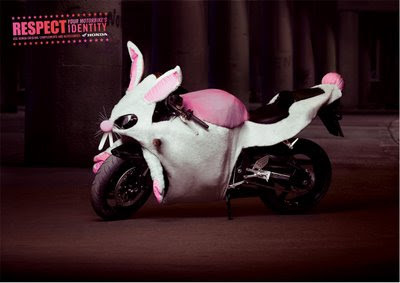 The motorcycle selection covers a broad range of modern motorcycles, including scooters, Enduro, Motard, Sport bikes, Naked bikes as well as version modified for racing ("race modified"). The developers have recreated 135 motorcycles from 124 cc up to 1670 cc, including both road & race versions from the 80's up to 2005. The racers are divided into categories, the semi-licensed race tuned versions (named "Race Modified") and the official fully licensed 2005 Suzuka 8 Hours endurance race bikes. Motorcycles from all major manufacturers are included as well as two specialized Japanese tuners (Moriwaki and Yoshimura), that appear in the list of manufacturers once "unlocked". While wet, dirt and reverse classic GT4 racing conditions have been removed, a unique course was specially created for Tourist Trophy. The Circuit de la Comunitat Valenciana Ricardo Tormo is an official track appearing in the Superbike World Championship and MotoGP. It is also used extensively as a test circuit during the off-season. A new concept appearing in Tourist Trophy is the "Riding Gear" (named "Closet" in the Asian editions). The player can earn ("unlock") and collect 186 different riding accessories for his character including different helmets, gloves, boots (or shoes), pants, one piece racing suits and jacket as available commercially from more than a dozen manufacturers including (Simpson, Vanson Leathers, Alpinestars, Arai, Shoei, Kushitani, RS Taichi, Dainese, AGV, Lewis Leathers. Up to four different combinations can be saved including two racing leather suits and two casual outfits)." "This latest comic project is about a mysterious band of young Gypsies (or Roma as they are sometimes called) who center their culture around motorcycles. They thus are known as the MOTOROMA." 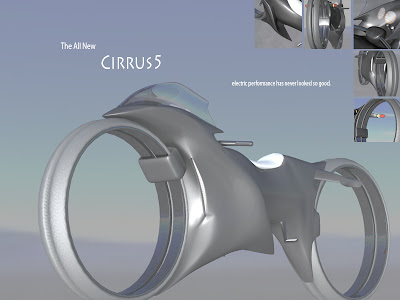 Samson Motorworks Announces the "SkyBike". "What human being has not had the dream of flying through the air with the same vehicle they are driving on the road? That dream could soon come true. By utilizing motorcycle manufacturing techniques and volume pricing, many pilots could soon own a personal, highly usable airplane for considerably less cost than a typical small aircraft - but not just any airplane. 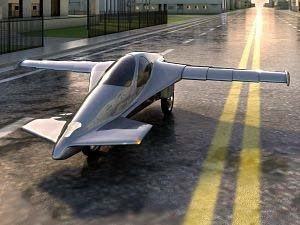 The SkyBike™ is an airplane that can be both aircraft and ground transportation. For many years, the ability to fly to a destination and drive away has been the dream of aviators. 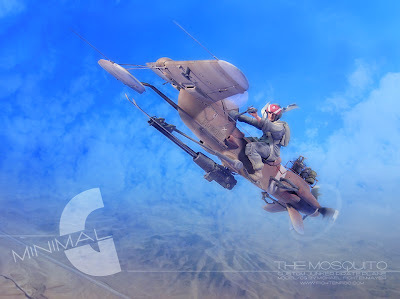 The innovative SkyBike™ from Samson Motorworks provides the ultimate transportation vehicle. 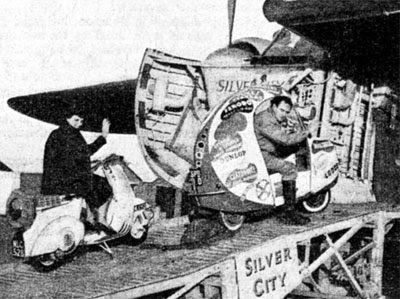 President, Sam Bousfield, said “with our three-wheel enclosed vehicle, you can drive in air conditioned comfort to a local airport where the wings are extended, fly to another airport to land, retract the wings and then continue to drive wherever you want to go.” If inclement weather sets in, instead of being grounded, one is free to drive home – an option not currently available to pilots. “This could make flying safer, as it takes away that ‘got to make it home’ pressure when the weather starts to turn rough,” he said." 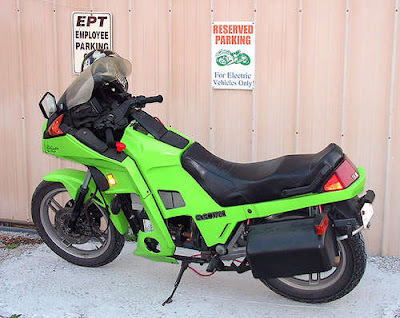 How to build a 96-Volt Electric Motorcycle. "Like many others I decided to quit waiting for a decent electric road bike at a reasonable price, so I built one out of a spare bike I bought off eBay for about $700. I based mine on a '82 Yamaha turbo because 1) I have the ICE version (hence the spare), 2) I like that it is fully faired so it looks 'normal' and 3) it's a shaft drive and one of my main goal was to make it as maintenance free as possible. Shaft drives weigh a lot more and are not as efficient as chain drives, but they are maintenance free. Here is a picture of the finished product. Like Stryker (who built the 72 volt version) I live close to work so distance was not an issue, but speed and performance were, as I have over 3 miles of a rather steep curvy road to go home on. One big thing to consider when doing this is the finished product. Like Stryker I am using AGM sealed lead-acid batteries because of convenience. But since I like the final product so much my goal has always been to upgrade it to some Li-Ion or Ni-MHyd batteries as soon as the become commercially available. It would shave 100 lbs off and give me twice the range, so it's an investment worth making." 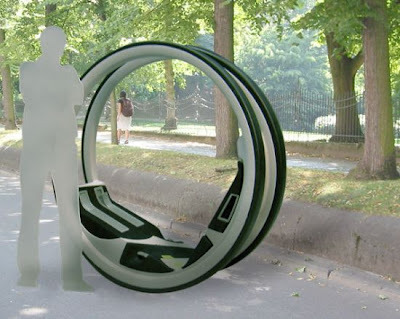 Designer Anke Salomon's public monowheel concept. "Keeping in mind the specific problems faced by tourists visiting Germany’s capital city Berlin, the City Bike by designer Anke Salomon is a bold new initiative that promises to make the most famous areas of the town more accessible for tourists. The Public Bike system will allow tourists to tour the parks and pedestrian precincts through this innovative rental bike that runs on two wheels that turn independently of each other. 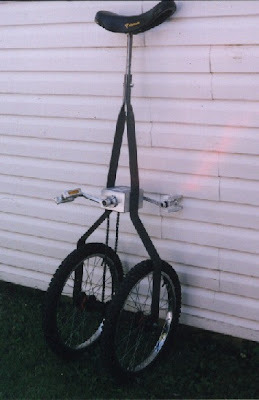 With the seat holding the wheels in position while gliding within the wheels on ball bearings, the bike is propelled forwards by pedals that are used in a straight movement. Apart from handles that aid in steering and braking, the bike also features a compartment for hand luggage. 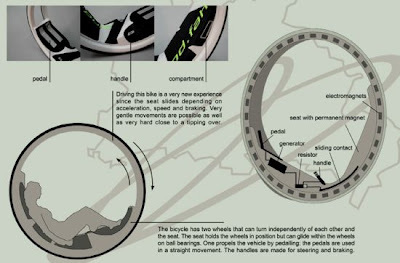 The drive system in the bike is based on a magnetic field with a permanent magnet fixed inside the seat and a number of electromagnets housed inside the wheels. Since pedaling generates an electromagnetic current drives the bike forward, a very negligible effort on th part of the rider is required to make the bike move forward which, of course makes this bike a strong contender for a public bike rental service." 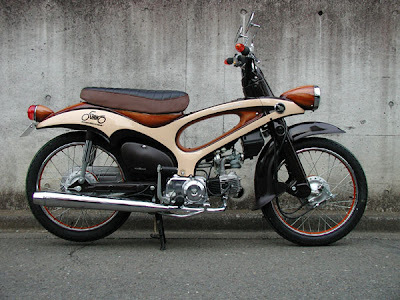 "Shown here is the “Super Accent Ogano Woody Super Cub50″ by White House, Japan. 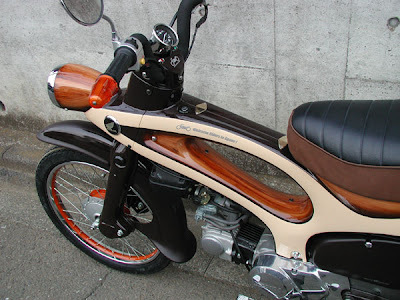 The seat looks like it’s upholstered in leather and really cool retro-classic Honda logos have been fitted. I’m not sure if it’s really made from wood or metal painted to look like wood." 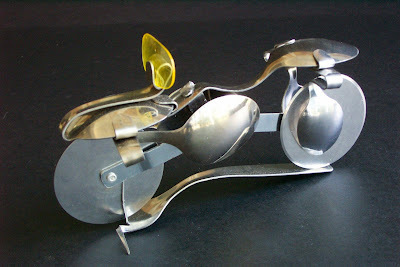 "motorcycle" by ~papafork: pizza cutters, sun glassess, spoons and table spoons, do we need to say anymore ? Our favorite hero: Spike Rhiando. "Whether by design or not, Alvin "Spike" Rhiando is something of an enigma. Much of his life was surrounded in doubt and confusion, but he was certainly a well-liked character in the early days of the 500 era. Spike was probably Canadian, born in Saskatchewan, though he was also reported as both American and even Mexican – others would suggest he had got no nearer Canada than the Greenford cinder track! He claimed that his parents were trapeze artists, and that as a child he was part of the act. He also claimed that he was scheduled to come to Europe on the Lusitania, on its fateful journey in 1915. In 1933, he did move to England, with the aim of establishing American-style Midget racing on the existing motorcycle cinder tracks. Although certainly more dramatic than the existing British alternatives on the long tracks (such as Crystal Palace, Lea Bridge, and Greenford) and stadium-based short tracks, the idea never really caught on. Contemporary reports all appeared to suffix Spike’s name with “the American dirt track racing ace”, although there is little evidence to justify this title. Through the war years, Spike apparently worked for the British arm of the Caterpillar company. The post-war government of Clement Attlee initiated the notorious Tanganyika Groundnut Project, and Spike saw the opportunity to make good money from his knowledge of earth-moving. He lasted nearly two years, returning from the fiasco with a comfortable nest egg. Spike’s mind was now on other things, and his racing programme reduced. He had become interested in the new glass fibre material. He came up with a very neat scooter concept and built a prototype. 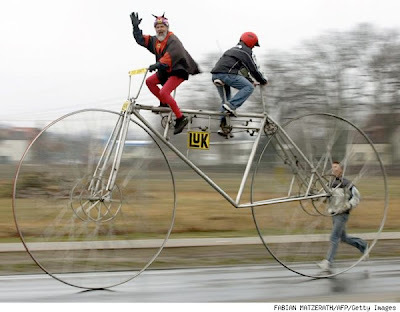 To prove the concept, he decided to ride it from London to Cape Town. In typical Spike-style, preparation basically involved packing a small bag and setting off! Somewhere in the Sahara, he was found in a very poor state, resting in the shade of a large rock, by a patrol of the French Foreign Legion. The scooter had worked fine, and may still be by that rock. For all the stories told about (and perhaps by) Spike, there is little doubt that he was one of the characters of the movement, and was fondly remembered by all who knew him, especially for his taste for lurid shirts most out of keeping with austerity Britain. Alvin "Spike" Rhiando was, and still is, a mystery." 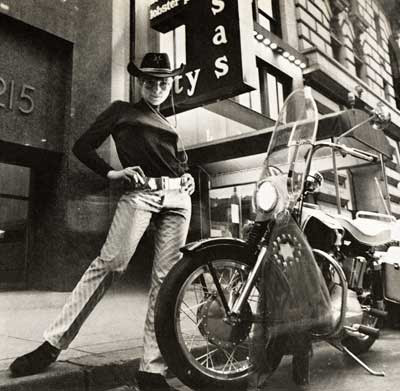 The Hat (and bike) Scene Of 1968. "Designer Diana Dew shows off a pair of striped pants of reflecting orange and gray that sold for $25 in 1968. Check out her felt cowboy hat and jacket that have a light-up star. The motorcycle was a Harley-Davidson Sportster XLH." The "little trip" Suzuki Choinori. 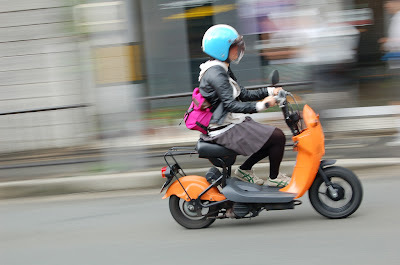 "The Choinori is a new 49cc four-stroke mini-scooter from Suzuki, aimed for the Japanese home market. Suzuki wanted to launch a small scooter model that was clearly cheaper than any other scooter on the market, and managed to do it. The retail price for the Choinori for 2003 is 59.800 Yen in Japan, that is about 40% cheaper than any of its competitors. Simple technology and cheaper components were the key to be able to make the Choinori that cheap. There is no rear suspension, to name a detail. The small engine of the bike delivers 2 hp, giving the bike a maximum speed is less than 40 km/h. That's normal figures for Europe, but the Japanese customers are used to get more power from their 50cc bike engines. The price could have probably be pressed down even more if Suzuki had chosen to assemble the Choinori in China, but to many people's surprise it is entirely made in Japan where the personnel expenses are high. The customers in Japan have mixed opinions of the new Choinori. Some people think that it's uneasy because it is too slow or because it doesn't have any rear suspension but other people think it's fast enough to move around in the town (where it was meant to be used) and the the fact that it is made in Japan tells it should be reliable. Time will tell if the Choinori will be a bestseller or a flop. The extremely low price should be a great advantage. A Japanese friend of mine tried to explain the meaning of the word ”Choinori” for me, it seems to be difficult to translate it to English. 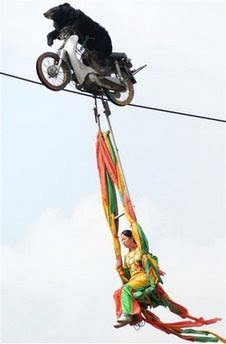 Choinori means something like ”to ride a little bit” or ”to ride around one's home, not far away”. The opposite, to ride a long trip, ”touring” in English, would be ”Tohnori” in Japanese. Choi means a little bit, Toh means far away, and Nori means to ride. That is, Choi-nori is the antonym of Toh-nori. Suzuki developed ”high-speed plating”technology for this scooter which enabled them to make sleeveless plated cylinders at a very low cost. This made the Choinori engine lighter than Suzuki's existing four-stroke 50cc engine by about 40%. So it's not just all about being simple. There are some new technology involved that actually help making it cheap. " 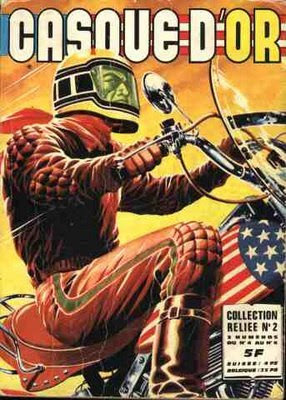 The French comic Casque d'or (Golden Helmet) was published monthly from 1975 to 1978. The motorcycle in Television: Nichols. 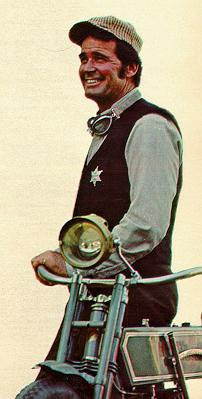 Nichols on his "replacement horse"-his motorcycle. "Nichols (also known as James Garner as Nichols) was a Western television series starring James Garner broadcast in the United States on NBC during the 1971-72 season. Nichols was a rather unusual Western in several respects. Its setting, the fictional town of Nichols, Arizona, in 1914, was rather late for a Western. 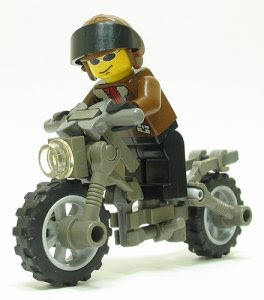 It also accounted for the main character, a sheriff, riding on a motorcycle and in an automobile rather than on the traditional horse. Nichols was also unusual in that unlike most Westerns, the hero, if that is truly what he was, did not carry a firearm and was generally opposed to the use of violence to solve problems, preferring other means. Unfortunately, this program did not do well in the ratings, resulting in the decision by the program's producers to kill off the title character. The greedy, but pacifist Nichols was shot down, to be avenged by his identical twin brother Jim Nichols (also portrayed by Garner), who arrived in town and administered justice in a more stereotypical (and it was hoped, more popular) Western fashion. This solution would have made recasting and retitling the program unnecessary while allowing for considerable changes. However, the episode in which the first Nichols was murdered proved to be the final one; before it aired, NBC cancelled the series, rerunning the earlier episodes during the summer of 1972." Saturday morning cartoons: Speed Racer-The Motorcycle Apaches. "In the American West, a convoy of trucks is crossing the desert. A group of motorcycles scream down the mountainside and attack the convoy. Meanwhile, Speed wins the Southwest Grand Prix. One of Speed's fans is admiring the Mach Five when Speed walks into the garage. He says that he wanted to be a professional racer himself but didn't make it. He doesn't give his name. That evening, Speed and the gang are dining with Mr. Skyhigh from the Office of Space Development. Later, in a ghost town Skyhigh is trying to enlist Speed's help to protect the construction of an international space development base. The crews and equipment are being attacked by motorcycle Apaches. The Mach Five is needed to transport a shipment of uraniumtane, an element that will give nuclear missiles an explosive power greater than an H-bomb." 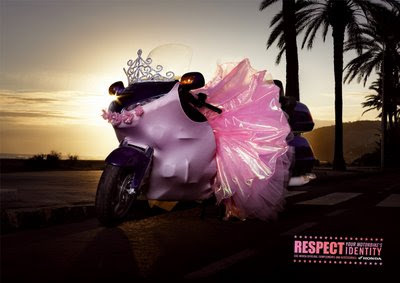 Great moments in motorcycle advertising-Honda's "Respect" campain. 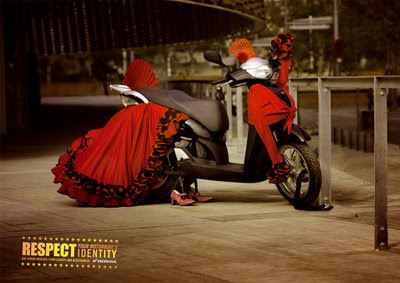 Copy: "Respect your motorbike's identity-Use Honda original complements and accessories." 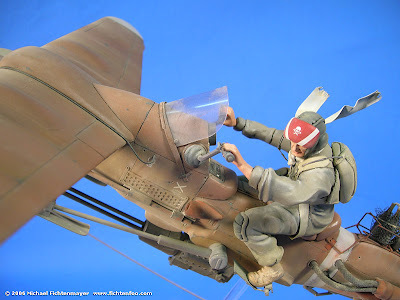 Gallery: fichtenfoo's skybike "The Mosquito "
Bad to the bone-or in this case a plastic brick. learning to love and live with the Crab Cycle. "I needed about 3 months to learn to ride The Crabcycle. For reference, it took me about 1 month to learn to ride the double wheel unicycle. I practiced along a high fence and have it set to go west (pedal forwards, go left). I kept going from right to left until I needed to hold on less with both hands, eventually brushing lightly with the right hand. One has to lean left, then pedal forwards. Next I learned how to fall off gracefully (it really helped me gain confidence). I held the right pedal down and let myself drop to the left. Next I tried to see how far many revolutions I could get without touching the fence. I had to get up to about 40 revolutions, until I felt confident to leave the fence behind. By 6 months I could ride a figure-eight with it. By 9 I could do a few and also riding by pedaling backwards, this took me many months to learn and found it took me longer to learn than forwards. Then at 10 months I just got idling with right foot down (it feels like a "Manual" or Skateboard Wheely) with the "required": ride in, 25 idles, and ride out. I am quite ambidextrous, but idling with the left foot down is too strange yet (it feels like your balancing on the front wheels of a skateboard, which is hard). At 11 months, I could reverse direction on the fly. Also got a figure eight while pedaling backwards. And I was was finally able to mount it a few times, with the right pedal down, not too bad once I put my mind to it (knowing idling sure helps). At 12 months I was able to just barely juggle clubs on it (learned first to idle with hands behind my back). Finally, at 15 months I got some left foot down idles... (ie ride into, idle 25 times, ride out). Just as hard for me, but maybe more impressive is the left foot on box idles. If I start holding on to something, I can do this one foot idle and then get my foot back on pedal and riding away. Still working on consistency and trying to figure out how to get my foot on the box from an idle. I hope to get more consistent mounting and get better at juggling clubs on it. Also trying full turn of the wheel idles (did about 4-5 ie one full revolution and then reverse). For 2 months now, I had the mechanism reversed to a "Go East" mode, ie. pedaling forwards one goes right. I was a total beginner once again! It took me a month to learn pedaling backwards and another month to learn pedal forwards. For some reason, I am more "left leaning" it seems. I rode in a circle the various ways and I was learning idling. Switched back to "Go West" mode. I felt I was not progressing quick enough. After 5 min of disorientation, I was riding again with ease. Today, after numerous attempts, too many to count, I did my first mount into an idle." Most dangerous and silly ideas begin with an innocent sketch on the back of an notepad. Youtube: The Bat-Pod in action. The Art of Hans Hemmert. EcoRider - Eco-Friendly Diesel Powered Vehicle. 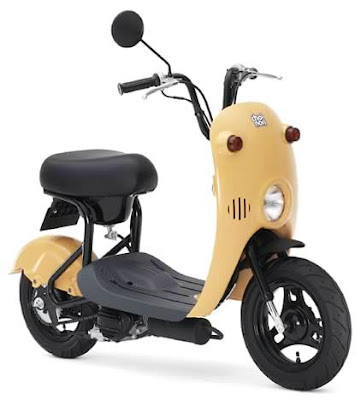 Buy me that!-Honda Cub scooter toy. 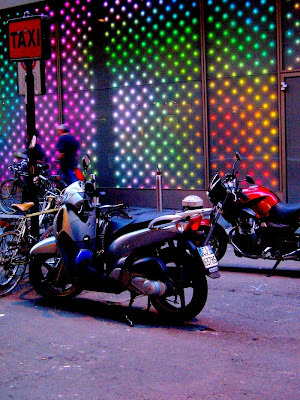 flickr: 80's glam metal in motorcycle form. 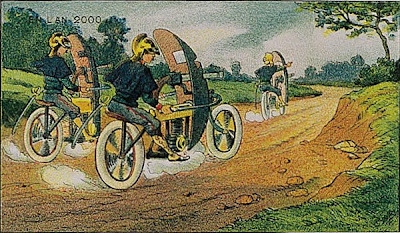 Early Tron Lightcycle concept art. modernmechanix: wooden balls speed cycle races. The Bike in the Warehouse. 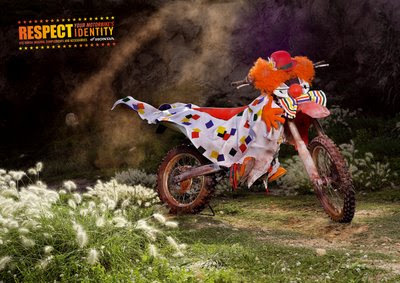 Great moments of the motorcycle in advertising. The Art of Michael Dunlap. 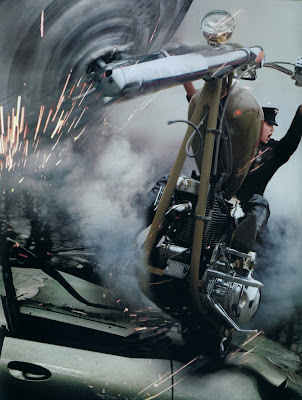 Magnum Industries "Fury" Hover Bike. The Pink half of the Drainpipe's "Vespa effect"
The mechanics of the Bat-Pod. Japan provides, We observe. The Futuro Bike. Buy me that!-The Buztronics Bike Pipe. They'll never know it was me. 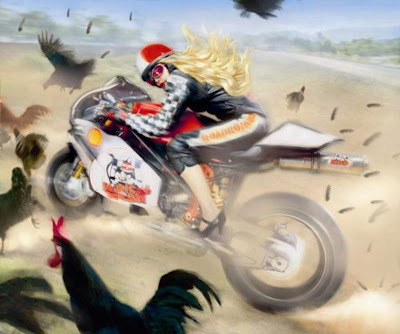 Etsy: Power Wheelie Biker Vinyl Wall Decals. 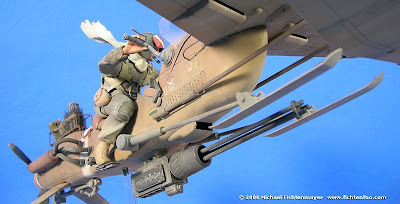 Youtube: The Litestar Pulse on Japanese TV. My postcard collection: Fold tab A into slot B.